Baby eczema can be very distressing for your child, and also for you, as their parent. Learning more about the condition, and what can trigger it, and how to treat it, can help you to manage your baby's eczema. Eczema is most likely to develop in the first six months of your baby's life. Normally between two and six months. The skin around the face, especially the cheeks, is initially where the symptoms will first appear. One symptom to look out for is extremely dry and flaky skin. It could also look red and very sore, so it may feel hot. The skin will definitely be very itchy. So look for signs of your little one scratching. And they will probably be scratching alot! As your baby gets a little older you may notice that their eczema starts appearing on other areas of their body. Though it can appear anywhere. In the first few months of their life your baby may get dry, flaky skin on their scalp. This could be cradle cap, which is sometimes known as Infantile Seborrheic Dermatitis. 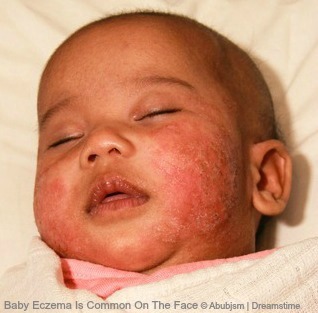 The main type of eczema that affects babies is Atopic Eczema. 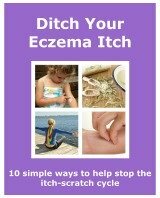 The first thing to do if you see any symptoms is to make sure that it is eczema. Speak to your doctor or midwife before treating it yourself. There is no definite answer to what causes eczema to develop in some babies. There have been a couple of reasons reported why eczema appears in some children, and not others. Although there is nothing that can be done to prevent these, there are a number of triggers that you can control. You can read more about them, here. A baby's skin is naturally more sensitive than an adults, so treatment may be slightly different for a little one. Always ask your doctor's advice before treating baby eczema yourself. Especially before using topical steroids. To read more about treatments used for adults, then Eczema Treatments is the page for you. When your child has infantile eczema, it doesn't just affect your child, it can affect your whole family. There are many aspects of daily life that may affect eczema, or which eczema may affect. I will be writing as much information as I can, to help you and other parents living with eczema. When I was a baby there wasn't the information around for my parents, so they just did what they could. As a parent you want what is best for your child. You don't want to see your baby in pain, itchy or not sleeping. So anything you can do for them will not only be beneficial to your baby, but also to you and the rest of your family.